Smooth it out. 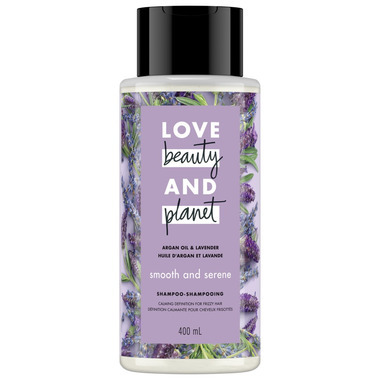 Love Beauty and Planet's Smooth & Serene Shampoo, infused with argan oil and ethically sourced French lavender, delivers a nourishing cleanse that gently removes dirt while lightly moisturizing and infusing your hair with a decadent scent of French lavender. This shampoo is infused with golden argan oil that we adore, it is known to give hair a boost of moisture and a dose of nourishment to smooth hair. Sourced from a women’s co-operative of local Berber women. Infused with French lavender, grown using the traditional ‘prefane’ technique - the lavender is cut by hand and left to dry in the fields for 2-3 days - gives this luxurious shampoo the unique fragrance of soft, floral notes balanced with slightly fruity overtures that are rounded out by sweet balsamic notes. Love Beauty and Planet's shampoos are also free of colorants, silicones, and parabens. They do not test on animals and their products are 100% Vegan too.